Perhaps you have already noticed a trend in your gym. A lot of people come, a lot of people leave and very few do stay consistently over the years. In time, it’s these few that usually form the core in a gym. They’re usually the ones who show up at the gym when they’re injured, when it’s snowing heavily outside, when it’s raining and pretty much all the time regardless of conditions. Let’s look at some of the types of people that will never become like this and that will quit BJJ sooner rather than later. This is usually the type of person that thinks or is the “shark” in their social circles/job. 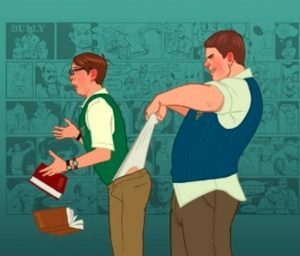 Also very common among people who used to bully others and were used to dominating people, whether physical or mentally. When they start BJJ and find out the cold, harsh reality and that they can’t really do anything to anyone slightly more experienced than them, their ego takes a big hit. Most of them go two ways, very few choose to go on the third. The first is they decide already to quit BJJ. The second, they choose to only work with partners they can dominate and/or only in private sessions, where they are not exposed. The third way, which very few choose to go, is to actually get rid of that ego, embrace the art and the saying “leave the ego at the door”. Figure 1. Bullies and egotistical persons have a very hard time in BJJ when they see they have no control over what’s happening to them. BJJ looks all nice and fancy and they are all up for trying it. Then something happens that maybe they didn’t see coming. They start sparring, their partners starts sweating and dripping it off on them. Even worse, maybe they gets a soaked wet gi on the face and get choked by it. This may very well be the last time that person tries Jiu Jitsu, since those elements make them very uncomfortable and they can’t justify it to themselves. We all know this guy. They are the ones coming into the gym, with no experience, stating that they want to become high level athletes that compete, win competitions and get paid for it. Then they start training and they go all out. They show up to each training session. Twice a day, three times a day, as many as humanly possible. And they keep it up. But not for long. They burn out and realize the toll this training volume takes on both the body and the mind and quit BJJ for good. Sometimes they can be saved from this self destructive path and be guided to a more casual training regime. Figure 2. Not everybody has the mindset to become a World Champion. Few people realize that. they’re the type of person that always puts their career first, with little to no regards for anything else. 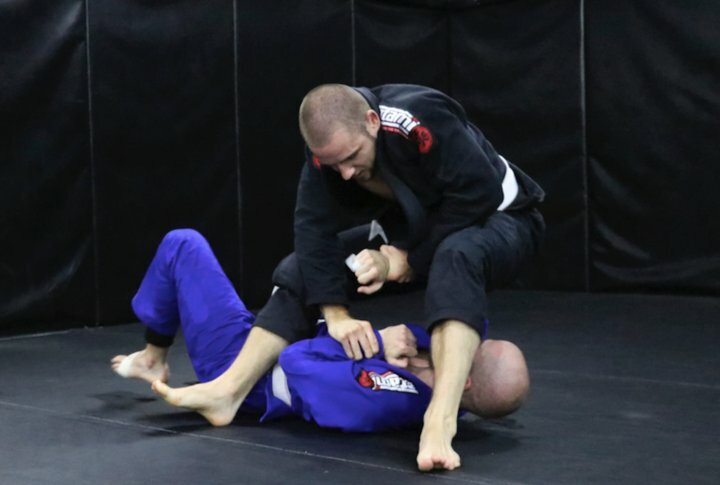 they start BJJ but if, by any chance, their work environment changes for the worst, they’ll soon sacrifice their training sessions in order to be able to deliver at work. The high levels of stress will also contribute negatively and they will be stuck in a vicious routine of working and getting in bad shape. Usually, the more the time passes, the lesser the chances that they will come back. The career person has their chance at succeeding by realizing the benefits BJJ has on their mind and, by default, their work. Sadly, there are some people that take up BJJ, enjoy it and want to keep doing it, however injuries always happen. 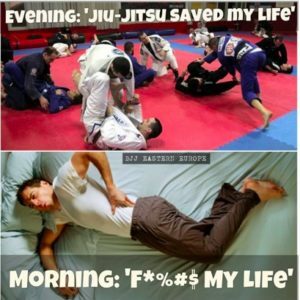 This usually happens to people that are very out of shape and, as such, their body can’t cope up with the demands of BJJ. They keep getting injured to the point where they decide it’s best to quit BJJ and try something else, if at all. They can be helped by lowering intensity when working with them and guiding them towards a good strength and conditioning coach/program in order to address their physical issues. Figure 3. Most injuries can be prevented through a well designed strength and conditioning system.